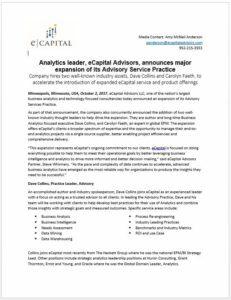 Minneapolis, Minnesota, USA, October 2, 2017, eCapital Advisors LLC, one of the nation’s largest business analytics and technology focused consultancies today announced an expansion of its Advisory Services Practice. As part of that announcement, the company also concurrently announced the addition of two well-known industry thought leaders to help drive the expansion. They are author and long-time Business Analytics focused executive Dave Collins; and Carolyn Faeth, an expert in global EPM. The expansion offers eCapital’s clients a broader spectrum of expertise and the opportunity to manage their end-to-end analytics projects via a single source supplier, better enabling project efficiencies and comprehensive delivery. Collins joins eCapital most recently from The Hackett Group where he was the national EPM/BI Strategy Lead. Other positions include strategic analytics leadership positions at Huron Consulting, Grant Thornton, Ernst and Young, and Oracle where he was the Global Domain Leader, Analytics. He’s spoken at over 70 industry events including for Gartner, IBM, and Oracle. He has also authored two books, Oracle Essbase & Oracle OLAP: The Guide to Oracle’s Multidimensional Solution and Dare to OLAP, an Oracle Essbase and BI Foundational Suite Primer. Dave will be based out of Chicago. As an experienced EPM (Enterprise Performance Management) and consulting leader, Carolyn Faeth has a history of helping prominent organizations generate breakthrough results. She’s developed a well-earned reputation for thought leadership by first understanding her clients’ organizational goals and then mapping them to a program that will generate those results as quickly as possible. She brings a comprehensive management background in global EPM implementation and transformation strategy as well as cross industry experience. Carolyn joins us most recently from Edgewater Ranzal. Prior to that she was with Deloitte Consulting. Carolyn will be based out of Colorado. Working with large sized and Fortune 500 clients, eCapital’s Advisory Services practice provides executive management with comprehensive cross-platform services including strategic council on business intelligence initiatives, operational effectiveness, analytics needs assessments, proposal development, solution architecture, forecasting and planning. eCapital also offers end to end technology advisory and consulting and business transformation services with specialized teams offering deep expertise across industries and leveraging the industries most advanced analytics platforms and solutions. eCapital Advisors is one of the nation’s largest performance management and business analytics firms. Since 2001, eCapital has enabled clients including General Mills, Post Cereals, Children’s Hospitals, Ecolab, Anheuser-Busch, Northwestern University and hundreds of others to make better business decisions through their high level software solutions and services.. The company has been frequently recognized with numerous awards including Inc. magazine’s 5000 fastest growing companies. eCapital Advisors is privately held and headquartered in Minneapolis, Minnesota. For more information visit us at https://www.ecapitaladvisors.com.